A curiosity puzzled the Cumberland ballists prior to their recent match against the Machinists of Knoxville. They stood round the infield preliminary to the contest at Bi-centennial Park wondering, What did this number represent? What bi-centennial? The present year of our style of ball being 1864, what had occurred two hundreds before, or on two hundred occasions, that had led to the naming of this handsome, commemorative park, sponsored by largesse of the citizenry? The puzzlement of the gentlemen assembled was short-lived as the base-ball contest commenced. And what a contest it would turn out to be, especially more than two hours later, as the last inning of the game dawned. For at this point, after eight full innings of competition, following base-knocks, rallies, falters, and recoveries on both sides, the score stood even, at 15 aces for each of the clubs. The Machinists had the advantage, waiting to bat in the latter half of the frame. They reserved the final word of the batsman, to offer the final score to no reply. But the Cumberlanders have seen many valiant efforts this season sink in the depths of the final inning, and on this afternoon were determined to keep their victory-craft afloat. Each of their nine batsmen strode grim-visaged to the plate, determined to strike decisively. Rip was 3 knocks in 6, and partook in the last-inning rally. And strike they did! Sugar, the newly-minted third-sacker, was first to the striker’s box and – knock! – punched a safety to the out-field. Next was Books, in whose care are volumes telling of many such heroic innings in the lore of the game. Knock! – thundered the bookman’s lumber. Then it was Maestro, composed as he tapped the dish with his sporting baton and awaited the hurler’s offering. Knock – a third straight hit. Rip, Ozark, and Pepper all followed with tallying strikes, and the Cumberland hit factory had engineered three crossings. In the field, one could see the Machinists’ spirits rusting in this final on-slaught. And so it would prove, as the visitors from Knoxville went quietly in the last of the frame and the Cumberlanders prevailed, 18-15. What manufacture of aces had been seen on this day! What an affluence of base-knocks! In all, the Cumberlanders would hit more than 30 safeties on this day, and every man of the nine would bat in at least one of his fellows. 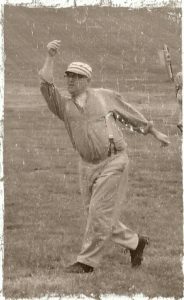 Ozark would score four times from the initiating line-up position, Jip would strike perfectly five times in as many attempts, and every batsman would reach safely on the day at least twice. 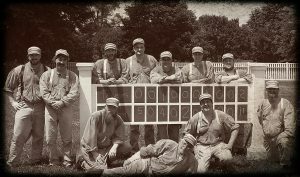 The Cumberlanders again entertain visitors this week at the Bi-centennial Park. Maybe the term refers to the two hundreds of safeties the team can eventually expect to strike there, at their current pace! As the Machinists can aver, the Cumberlanders are a mighty dynamo for producing hits on these public lands. The sun was a blazing beacon in the Cumberland-blue sky, baking the Hermitage grounds as two proud clubs readied for noon-time battle. But the fiery orb in the heavens was but a weak sister to the fire in the eyes of one of the clubs. ‘Twas the blue battalion! The Titans in Teal! Jackson’s Jolters! For on this day, you would have been forgiven for thinking that Old Hickory himself had picked up a willow to knock the ball around the orchard, for no blaze would be more searing than the burning eyes of every Cumberlander on this sunny afternoon, to claim the prize for Lady Victory! From the pre-contest bat toss onward, this day would belong to the men of the mighty Cumberland. Pity the poor Travelers, whose excursion from Brentwood was thwarted by such greedy hosts. For after a quick first frame for the visitors, the home team’s fire caught and began raging. The first five Cumberlanders to the dish all banged out safeties – Ozark a double; Pepper a single; Burnside a single, plating Ozark, and bringing to the line Cumberland’s fiercest striker, harbinger winner of the bat toss, Jip! There followed one of Jip’s mighty wrong side blasts past the solitary poplar in the starboard pasture, ringing up two more aces. Spoons then helped himself to his own taste of the feast with the first of his quartet of bingles on the day. Spoons would reign as the man of the match, unable to be put out by the Travelers in any swings of the stick. Five runs having crossed in the first, the Hermitagers turned up the heat again in the third. Pepper, Burnside, Spoons, Catfish, and Professor all knocked safeties and four more came across. The Travelers, a merry bunch who were good sports all, nevertheless glanced from man to man and wondered whither had fled the team that they had spatchcocked, 22-3, when the teams met last in May 2017. But it was not solely base knocking that made the difference one May later, for the Nashville Club’s defense sizzled as scintillatingly. Jip threw out man after man with harpoon-like throws from the third sack. Pepper ended a minor threat in the second frame by fielding a spicy ball behind second and executing a neat slide-step as he threw out yet another sad Traveler. Catfish had his usual stellar game in left including a miracle catch of a majestic smash into deepest the deepest corner of the portside pasture, across the foul line, his liquid stride taking him through a gap in the outfield fence as the partisans satagape, silent for a moment before bursting into wild acclaim for the man who is likely the best defensive Out-fielder in the Association. Rip made a running catch in the sixth inning in foul grounds off first base of a tricky ball that arced through the air like a plugged quail; he ended the play cradling the bird in his arms like he was bringing home dinner. Ozark and Burnside, the Beard Brothers, traded smiling plays in the center field. Spoons and Slapshot each logged solid innings on the mound, keeping the Brentwooders baffled. Maestro at the dish and Books on the first sack both played solidly in the field. From left, standing: Jip, Pepper, Ozark, Books, Spoons, Catfish, Maestro; sitting/kneeling: Burnside, Slapshot, Professor, Rip. Following the contest, the Cumberlanders, hardly believing themselves the authors of their own heroic tale, surrounded the score-board, as if to keep it from slipping quietly away, like so many chances for victory had evaded them so far in this young campaign. In the intoxicating aura of victory, Slapshot was so full of love for the universe that he reclined in the foreground of the photograph as if awaiting the service of wine and victuals by young maidens. Winning, indeed, is a splendid elixir, and no less wonderful when it is served up in the vintage league! The Cumberland Club of Nashville will look to extend their streak of victories to TWO when they take on the Franklin Farriers, Sunday, June 2, at the Carnton Plantation. This is all well and good, but sometimes our noble aspirations fall to earth, quashed by limitations in the physical world. And so I present to you, dear reader, that great humbler of ballists, that muscle which at moments inopportune reduces a Mercury of the base paths to a mere gimp on appendages of balking meat. Yes, I speak of the curse of the hamstring. 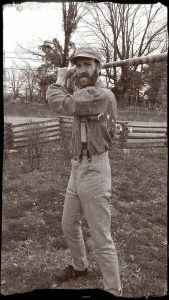 As they prepared to swing the lumber in the home side of the seventh frame last Sunday, on a sunny day in General Jackson’s back pasture at The Hermitage, the Cumberlanders trailed the visiting Quicksteps by a count of 8-4. And yet momentum seemed ready to turn as Slick of came to the dish and shot a hempen line o’er the outstretched limbs of the Spring Hill short-stop to lead off the inning. But here the Cumberlanders valiant hopes began to reveal themselves as cruelly tethered to the base earth. ‘Twas the HAMSTRING of Slick that jerked the chain back, as Slick could barely hop-limp down the baseline, like a lupine snared in a leg trap. Slick made first, and Cumberlander hearts were gladdened, and yet to encircle the diamond to return home seemed as vain a quest as rounding the globe in a rowboat. “A runner!” pleaded the faithful partisans, their hopes tied round the metaphorical feet of birds released toward the heavens of mercy and fair-play. But the Cumberlanders, alas, had only brought nine to the field, and so had no substitute. “Nonesuch shall ye receive,” announced the heartless arbiter, or so it sounded to this recorder. “Can we not allow another to run, as a courtesy?” asked Captain Pepper. Alas, the arbiter was following the letter of the ballist law, and so poor Slick had to contend with his agony, lest the team fall under the shadow of forfeit. Two batters later, Jip’s liner to the outfield was reduced from hit to force-out, as the ball was returned to cancel Slick before he could reach the second sack. In the eighth inning, the Cumberlanders made their opponents step quickly to the bench on the top and then plated three in the bottom half in reply, in one of the sky-blue’s best innings of the season to date. With one out, Pepper doubled and then the powerful slugger Jip did the same, bringing the score to 8-5. On the day, Pepper and Jip, in the second and third notches, were the C-landers twin hitting stars, each tallying four hits in six. But now Jip waited on the middle sack as a second man went dead. But then, lightning! Catfish and Professor each struck decisively, and after the wearying Quicksteppers threw the ball recklessly, Catfish had plated, and Professor stood at third, the score now 8-7. But woe was the song of this afternoon for the Cumbermen, as the hammy had not concluded its dreaded work. The injured Slick, hardly able to stand, was the second of two speedy exits in the bottom of the 9th. Rip and Pepper did their best to push the needed run across, with two-out safeties, but sadly the uprising ended there. Eight to seven, again! For by this same score had the Cumberlanders also succumbed to the Scouts in their last contended match. And these final numerals laughed from the scorers board at the men in sky blue, as their hopes were grounded again, slapped down by a ham. 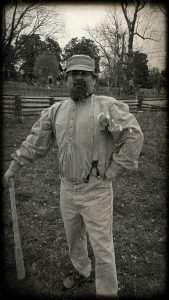 The Cumberland club hopes to field enough men, wake up the bats, and remain healthy against the Travelers, at The Hermitage, May 20. As the moment grew nigh to begin the Oaklands Cup competition last weekend, and the Cumberlanders stretched and preened before myriad photographers, sportively hurling stitched leather orbs to one another like so many promises of future successes on the field of play, the skies above cleared and the sun began to smile down upon the base ball grounds, symbolic of the hopes of the team whose blouses matched the newly teal blue sky overhead. Alas! the skies did not forecast well the Cumbermens’ fortunes on this day as the Hermitage dwellers would fall short in both of their balling efforts, dunked 10-7 by the Scouts of Stones River in the matinee, and then left behind again (that is to say, Marooned) in the nightcap, 5-2, by the bibbed crew from Nashville. But those teal skies did seem oh so honest as the day began! Sporting a new lineup that led off with its most hirsute campaigners, orange-bearded Burnside lashed a wrong-side two-bagger, followed by Ozark of the red chin-nest with a single safety. Three batsmen later, a trio of runs had crossed. Dollar Bill, in his debut as a member of the tan and blue, hit a cloud-scraper to left that plated an ace by means of a sacrifice. Then, after Catfish had a base-knock, Professor belted one to short that seemed a sure double-killing. However, the throw to first went errant and when the dust cleared the Cumberlanders were looking poised to deliver a long-delayed message to the Scouts. ‘Twas Uncle Jesse’s crew that gave up seven in the last frame of a first-round contest against our Cumberlanders in last year’s Sulphur Dells tournament, and here it seemed as if the blueshirts were finally delivering those last three plates that would have won that September contest, which has left us to toss and turn in our bedsheets these six months since, wondering Oh! Oh! What might have been! But rhetorical comeuppances do not win sporting contests, dear reader, and this day would again belong to others than the men in shiny suspenders. Again there would be a late rally, with four coming home in the seventh frame, but this only made for a sad echo of the too-little, too-late Fall encounter. In the nightcap, a tense, defensive-minded affair went awry in the fifth frame, and the sky-blouses seemed to lose the springs in their legs as the game went on, going one-two-three in the first, fourth, and last frames. As he had in the first contest, Catfish, while nursing a chest wound from a banging he took in the outfield in a rainy scrimmage game earlier in the month, nevertheless went two-for-four, to make four hits of seven for the day. He was joined in the firmament of hitting stars on the afternoon by Spoons, who was four-for-five on the day, including three bingles in his last three trips to the dish. The day was also full of standout defensive plays, none better than when in the late match, a throw from across the diamond pulled the diminutive Rip two strides off the sack at first. Sensing a close play, Rip lunged back with the horsehide sphere clenched in a single outstretched bare hand to his full five-and-a-half feet, touching ball to bag a half-step ahead of a careening Maroon. 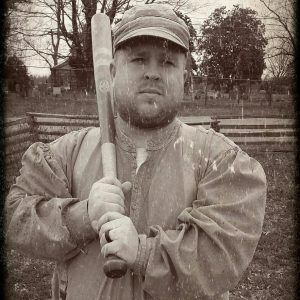 The Cumberlanders will trade innings again with the Scouts on the seventh day of April at the Ravenswood Mansion in Smith Park, in Brentwood, for the second game of their sophomore campaign.